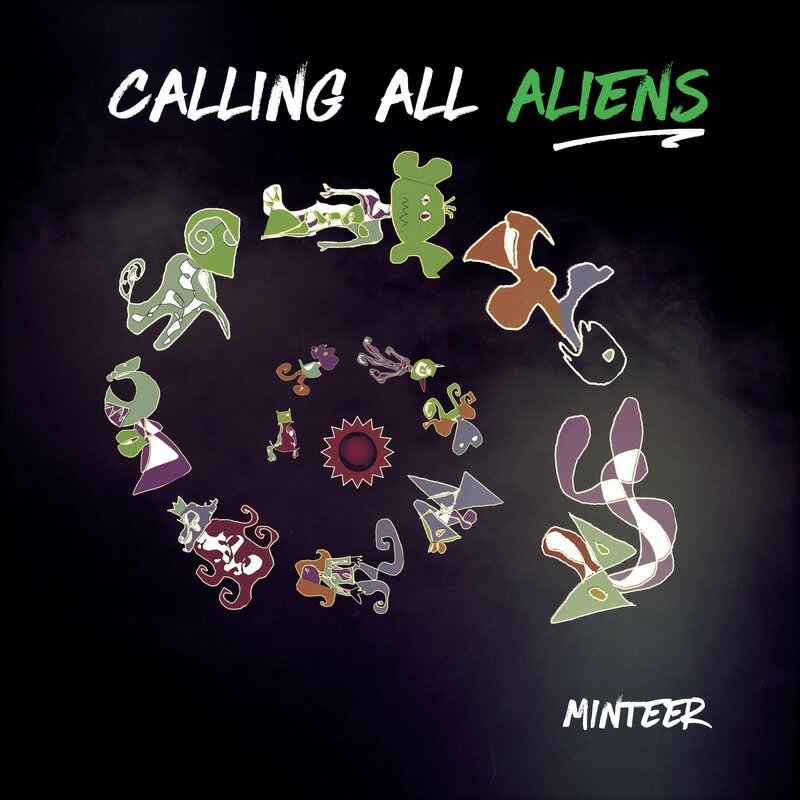 From the United Kingdom to Canada, the United States to Pakistan, from Malta and The Netherlands to Sri Lanka and Morocco, artists of all flavors added their unique stamps on a new MINTEER album, Calling All Aliens. 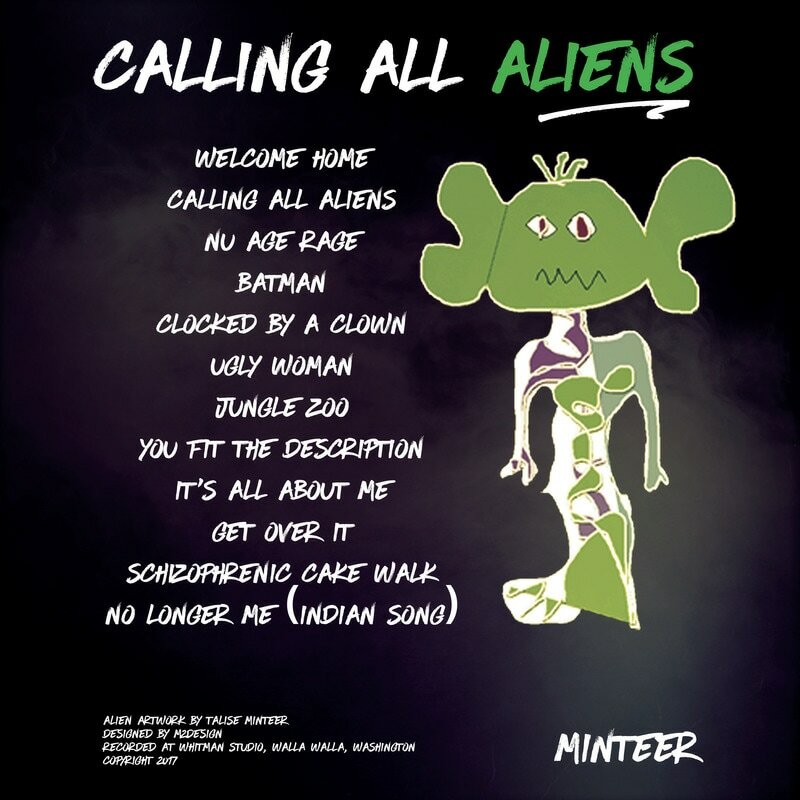 With the likes of Batman and Ugly Woman, to Jungle Zoo and Clocked By A Clown, this fun and eclectic mix of captivating tunes will surely reach you, no matter how far off into space your stare. “At first, we weren’t sure if we should feel privileged by this strange invasion, or threatened. Looking exceptionally glorious, they descended from the twilight skies in their glistening crafts emitting jewel toned beams of light. They proudly arrived to our desert cities bearing gifts; food and drink elixirs more exotic than anything ever known to us. They fluently spoke our languages. “Welcome home,” they enthusiastically expressed in friendly tones. It all sounded so favorable and good, perhaps too good. Yet we felt honored to surrender to their guidance, to bask in their apparent splendor. Before we could attempt to understand what was truly happening, things went haywire. Up became down and down, up. We were mentally confused and saw unbelievable visions. I, leader of the Mojave Sector, experienced terrifying apparitions as well, witnessing my childhood hero, Batman, being forcefully and bloodily extracted from his suit, observing angry clowns screaming and clawing at my family, seeing smiling obese women wielding smoked turkey legs lounging in the back of speeding pickup trucks, and watching what looked like a band of mixed jungle animals drinking cocktails and swinging from golden chandeliers through the skies of our city. Calling All Aliens - Soon after their arrival they began calling celestial buddies to come and party in the Earth’s deserts and to taste the one-twenty proof human moonshine. Nu Age Rage - This bluesy instrumental performed by the invaders became Earth’s new anthem under the alien tyranny. The musical mid-section was also an encoded message transmitted to attract more space partiers to the planet. Batman - Under the aliens’ psychotic influence, the leader of Earth’s Mojave Sector heard much laughing while seeing terrifying visions of his childhood hero, Batman (from the 1960’s), being harassed. Clocked By A Clown - If you ever get a free ticket to a circus and actually go to see it, do not make eye contact with any clowns or you’ll find real drama chasing you down. Ugly Woman - No worries. It’s just Bertha lounging in the back of a speeding pickup truck, dangerously wielding a smoked turkey leg and threatening with a promise to cook your next meal on time. Jungle Zoo - At the height of the alien party phase there were actually some fun moments which made us temporarily forget who was in charge. You Fit The Description - The constant partying took a toll on even the most ardent alien resistors. Our Earth guests were wearing us down, breaking us one by one. 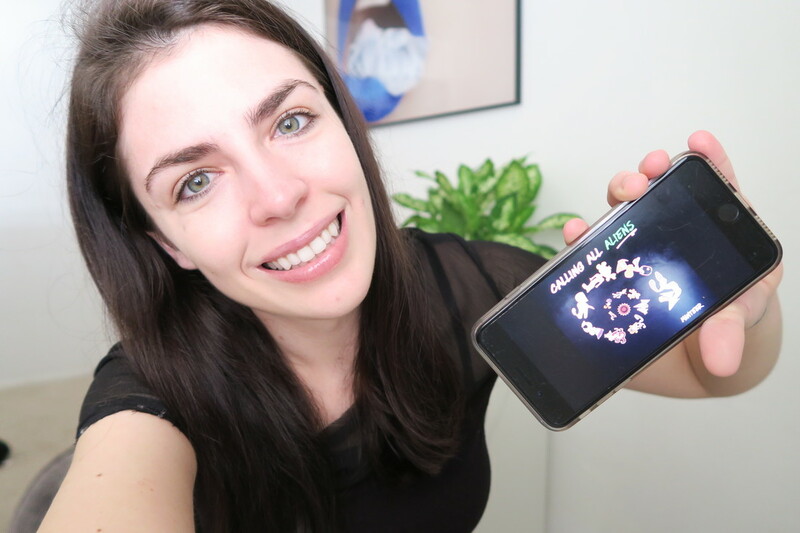 It’s All About Me - Whenever we tried to resist their influence, or even just temporarily hide from our alien captors to get a short mental break from their intensity, they would sit us down in groups and gently recalibrate us with this lullaby. Get Over It - Many of us began to openly complain about being victims of this new screwed up society – to deaf ears. Schizophrenic Cake Walk - At last, we found a weakness in our captors’ powers, based on an old musical game. It drove them mad, but only temporarily. No Longer Me (Indian Song) - Our moonshine drinking extraterrestrial friends, by force, at last instilled in our psyche the ability to get intoxicated on water they had extracted from our fellow desert dwelling humans. We immediately danced to a strange new tune and again celebrated the alien presence, losing ourselves and our minds once more, but this time, without reservation.